Zairah Khan is the driver behind this event. She is the CEO of VIVE Invest, which helps to identify opportunities for funds, philanthropists and investors to enrich their portfolios with female headed innovations. VIVE is working as a field builder in order to bridge the funding gap for women entrepreneurship. Zairah has worked as an independent social entrepreneur for a number of years creatively addressing social issues. 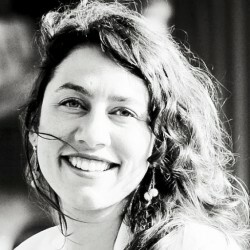 She also Coordinated and launched WO=MEN, the Dutch Gender Platform, a network to connect activists and professionals working from the Netherlands on global gender equality and development.